Every time I renew my driver’s licence I have the same old lame conversation with the Road and Traffic staff. So that’s why my licence photo always looks suitably sullen and displeased. It got me thinking about what kind of expression I would have to wear on my licence photo if I lived in Thailand. Clearly my eyes would have to be tightly shut and my mouth would have to be open, forming some kind of four letter word. After all, that’s the expression I wore every time I travelled on the roads in Thailand. And I wasn’t even driving (we considered hiring a car but we didn’t have the psychological fortitude to take the plunge – bungy jumping and swimming with stingrays were seen to be less hazardous). The traffic is something you have to see to believe (now I am not having 'a go' at the beautiful Thais but their driving may indicate that they have a death wish not only for themselves but for everyone around them). Don’t get me wrong. I understand that some people have a need to live on the edge. Some like the thrill of riding fast motorbikes and rally cars. Some enjoy driving four wheel drives in rocky terrains and others just like seeing how fast their 15 year old cars will go. Gosh, there are even those who like the occasional game of Russian roulette. Thai drivers do it all. Every time they hit the roads. No matter what they are driving. It’s not for the faint-hearted. If you happen to be from one of the few countries in the world who drive on the left side of the road (like we do in Australia) you have a slight advantage. The official road rules are actually quite similar to what I’m used to but the rules of engagement are essentially Thai. The expression, put your life in someone else’s hands comes to mind. It’s a big call to get behind the wheel (and that also includes sitting in the back seat). The general knowledge of any sort of road rules appears to be non-existent. Such things as overtaking at speed and signalling (even when turning across several lanes of traffic) are not practiced. By anyone. Motorbikes will cut you up left and right at the same time. They will pull out in front of you and expect you to stop, all the time while pedestrians are weaving between traffic queues without seeming to notice cars and motorbikes heading towards them at 50 kms per hour and a few centimetres away. In the country where the roads seem to be appallingly potholed in places, there are no rules given the local drivers have had to drive round these hazards for years. They will use the bit of the road without holes. That’s why it may be possible to find yourself on entirely the wrong side whilst someone going in the opposite direction passes you on their wrong side. Compared with Western countries the passing of a Thai driving test is a mere formality which takes around 10 minutes in a car park with cones. Until you pass this test you can drive anyway without ‘L’ plates if you are with another driver. In fact you can probably do that with the whole family on your bike or piled into your car. Seat belts are not a requirement. We mainly caught Tuk-tuks to get around. On one trip we met this gorgeous driver called Mr Sam. He had driven us to various areas around Phuket (taxis are cheap) and during a near miss with a bike we asked him if he rode a motorbike as well. He said that he did but not as much now given he'd had an accident some years earlier and was badly injured. He then completely turned around in his seat, while still driving, took off his sunglasses and showed us that he only had one eye. Oh.... I hadn’t noticed. So if you want to drive in Thailand not only do you have to have a driver’s licence but you should also possess these other must haves that locals clearly possess in abundance: a permanent smile (even on your driver's licence), nine lives, the patience of a holy-man, eyes in the back of your head, a crystal ball, the reflexes of Michael Schumacher (and heavy medication just in case it all goes pear shaped because it may take some time for an ambulance to rescue you in that traffic). So who is up for travelling to South-East Asia to check out this dangerous pastime? It’s actually very good fun! Once you live to tell the story, that is. 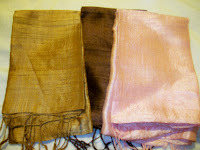 Another giveaway – one lucky commenter will win a Thai scarf. All you have to do is leave a comment by 11 Dec and by some magic hocus pocus and a clever algorithm a winner will be selected. I feel like I was just there! What a great description. I'm just the littlest bit terrified to go, what with the whole taking my life in my hands just getting from point A to point B, but I'm absolutely intrigued. Excellent post! Ohhhhhhhhhhhh!!!! Pick me, pick me!! Those look so lovely!!! I'm so glad you're back and had a great trip (traffic excluded of course!)!!!! How nice. I dont have to go anywhere at all..... You just described everything about the traffic outside our gates. For every single thing you wrote, we have a matching thing going on here. It was bad in Puerto Vallarta too! But you know, the strange thing was that there weren't very many accidents! You learn to drive very defensively. Holy cow! I wouldn't be able to hack it. I'd probably just curl up in a ball and never attempt to get behind the wheel. You are a brave woman indeed...!!! A number of years ago I visited Hong Kong and stayed with my Aunt & Uncle. My Aunt offered me her car to drive (a brand new Saab BTW). Silly me, it was a nightmare...the traffic...!!! I only ever drove once and stuck to public transport after that...you need nerves of steel to drive there every day, I couldn't make out any road rules whatsoever. What amused me the most though was that at most times of the day the traffic was like your photo in Thailand, bumper to bumper and barely moving. When it came to a stop, (as it invariably did) all the drivers would sit on the horn, the noise was unbearable...what difference they thought it would make I cannot fathom. The scariest taxi experience by far though was had one night when my cousin and I went to a bar in Stanley. Around midnight we decided to get a taxi home and told the driver where we needed to go. To our great alarm he headed off in the opposite direction and didn't respond to our telling him he was going the wrong way. We were headed around a series of bends when we had to slow right down...my cousin and I took the opportunity to open the door and leap from the cab...it was just like something from a film, we hit the ground and rolled down an embankment where we stayed until he had gone. When I think about it now I get quite ill at the thought of what could have happened. We had to walk back to Stanley and call my Uncle to come and collect us. I'm so glad you survived your Thai traffic experience and made it home safely. I missed your posts very much. Lily, I know what you are talking about;) Thailand I think has quite some similarities with the Philippines especially with the traffic situations. If you are up for some relaxation next time, I invite you to visit us in our farm in Palawan when we are already living there. I'd walk. I don't mind traffic, but I don't like crazy traffic. I lived in and around Boston for years and years, and I would never drive downtown there. So I know Thailand's out. I'll give sexual favors for a scarf. This sounds very similar to our city Asuncion, which I posted about, a while ago... It´s like living on the edge! We have a major highway here that is at it's widest point with all the lanes, ramps etc... 32 lanes across and every day it is jammed with traffic! They call it rush hour, really is it people that are rushing to get no where in that hour! Your picture is all too vivid and I can only shrink back in horror! Driving in Seattle is bad enough! In our area in particular, the streets are narrow, the cars are big, there are lots of people on bikes. The freeways are a nightmare, but still in comparison to Thailand, we've got it all too easy! Marvelous post -- as always! and the scarves are lovely! Oh very lovely! I'd love to win! The trip looks interesting. Sounds like fun though. *SIGH* Wish I was there. It felt like I had this story before...I had, when Brandon returned from Nigeria he talked of the exact same nightmare. Everything, from the potholes to the pedestrians and even the motorbikes cutting you off. When he returned home after two long months. I picked him up at LAX, The first thing he said when we got on the freeway. "the freeway looks great, there is no traffic." We were actually in bumper to bumper traffic. I guess it's all relative! I have to smile. I always look a little...shall we say...slow when I'm not smiling! My worst taxi experience was a guy down in Cancun, Mexico who was weaving in and out of traffic at 90 mph WHILE HE WAS WATCHING TV on his dashboard, and turning around to laugh with us. Somerville Circle in NJ at 5:00 PM is as close to Thailand as you can get on this continent. I have seen footage of driving in Thailand. It's not really driving as much as aiming isn't it? Sounds like an adventure inside an adventure...and I though New York City was bad!!! wow, it sounds downright dangerous over there. hmm...I get nervous driving in North America! Thanks so much for stopping by my blog today! I'm really enjoying exploring yours. Driving in Thailand sounds almost like driving in New York City! oh Lilly you weave such interesting and 'scary' stories and thanks for making me laugh. I hope I win too. that was a great field trip! And no one spilled soda on me, or peed their pants. Oh my...that sounds like fun! One vacation, I went to the Caribbean and we piled into a van to go on some random expedition. The driver would swing around these corners at warp speed while I'd fearfully be looking out the side window at the hundred+ foot drop into a ravine. S-C-A-R-Y!! Thai traffic is the most insane traffic I have ever seen. You are either going at breakneck speed on the wrong side of the road or you are at a dead standstill for hours. 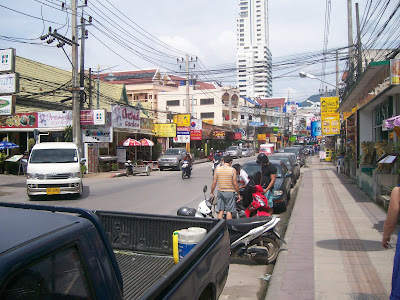 When I was teaching in Bangkok, the school I taught at was 5km away from the hotel we were living. The bus to school left at 5:30am and would would arrive at school at 7am for breakfast. If the bus was 30 mins late, we would miss the start of morning classes at 9am. Just truly insane. However, I wish we had tuk-tuks here. They are a great way to get around. First things first, what is wrong witht eh way they drive. That is how I drive too. As for the scarves, I choose pink, naturally. You want my Addy now for the scarf? Oh my goodness! I JUST went to renew my driver's license yesterday and the guy looked at my previous one and said, "WOW! I LOVE that you smiled the last time, but now you have to..." and I cut him off and said, "Pose for a mugshot? Whatever...bring it on" Of course, after that, I could barely stop myself from laughing! By the way...Hello...nice to meet you. I found you through Braja...she's broken so I'm expanding my horizons! Sounds like a lot of fun to me. I would rather be dodging cars speeding than sitting behind someone that refuses to speed up a little. Although I do not want to be around any driver that has consumed alcohol. You should have given it a try Lilly. Lilly, my turn to apologize for being late :) I finally got online, yay! I just do not drive in busy traffic let alone maniac traffic like this. They have a lot of road deaths in Thailand and you can understand why. I will have the pink scarf Stefan. It is so not your colour. This rather reminds me of Egypt. You took your life in your own hands when you tried to cross the street. Sounds like some parts of Sydney Lilly. How about some of those streets leading to the bridge at the North Sydney end? Do you want my postal address now? I was just recently in Thailand on business. I was working so much I didn't have time to shop. hint hint. I did love it and can't wait to go back and spend some leisure time. I never did try to drive though. Sounds like quite an adventure. YEAHHHH I still have a chance to win something from Thailand???? I'm so excited! Okkk..I would NOT make it Thailand then. I would either pass out from exhaustion or beat someone in anger. I'm not a good driver as it is, putting me in bad driving countries would be a huge mistake. Wow! What a description. I am not a fan of "city drivers" due to their lack of regard for the road rules.. I couldn't imagine being there! It really sounds just like driving in central london. I have always wanted to go to Thailand... but maybe now I'll wait. I'm still recuperating from the atrocious drivers in Italy form our 2006 trip. That was a great post... I feel like I've been there now. I would be crying, if I had to drive a car in Thailand. If I had a one eyed driver, I would be thinking, "Yup, I am going to die." Lilly, I really like your blog--I feel like I've taken a mini-vacation! Beauty in some ways and not others... I think I'd prefer to bike. Thanks for sharing the experience. Thanks everyone for your comments and entries into the giveaway. Comments will close when I post my next post which should be Friday sometime. Sounds like we have loads of cities in the world with increasing traffic problems, probably an indciator for us all that we should be riding bicycles or something. That was a great story of Kerries as well. I think I will resume some normal posting for a little while but I do want to come back and discuss the issues of geriatric westerners with young Thai girls - when I get my thoughts together. I wish I had the nerve (and $$) to do such travels - it would be a very interesting experience. I, however, will settle for a chance at a scarf! :-) Thanks!!! So, if I suffer from severe road rage, I should skip the pilgrimage to Thailand? I don't think I want to experience driving in Thailand. It sound completely hair raising. I think I would have been scared to even get into a vehicle. We felt a lot like you did about driving in Thialand, and we are both taxi drivers. No we didn't even try! Wow, did you notice just how many little thais could cram on to one small motor scooter? The entire family travels together. We caught Tuk tuks that were very cheap if you bargained. Loved Thailand genereally. Great holiday. ... hocus pocus and a clever algorithm! Sounds much like driving in LA. Is it crazier than that?? Okay Lilly!! I have only one question; where is the picture of YOU riding the elephant? LOL!!! I have thought of that for days. I even told my sweetheart about it. Although I find this article absolutely fascinating, hysterical and very informative, especially the driver's license photo (not smiling) ROFL! !, I expected to see a HUGE elephant with a teeny tiny, barefoot, blond woman (you) straddling it's back, with your blond tresses flowing down your back, wearing only a leather thong and leather bra!! Oh wait! That was that Jane out of Tarzan. Okay, okay, at the very least I expected you to be holding a cute little cheetah monkey...oh wait. Maybe that's out of Tarzan too. Okay, I realize the allure of all those deals on crocs and sandles with socks was just waaaay too tempting for you. All the handbags and scarfs and jewelry could not be passed up. I understand...but I still await with baited breath for the photo of you atop a huge elephant. Okay, even a teeny elephant would do. Hugs and love to you!! !